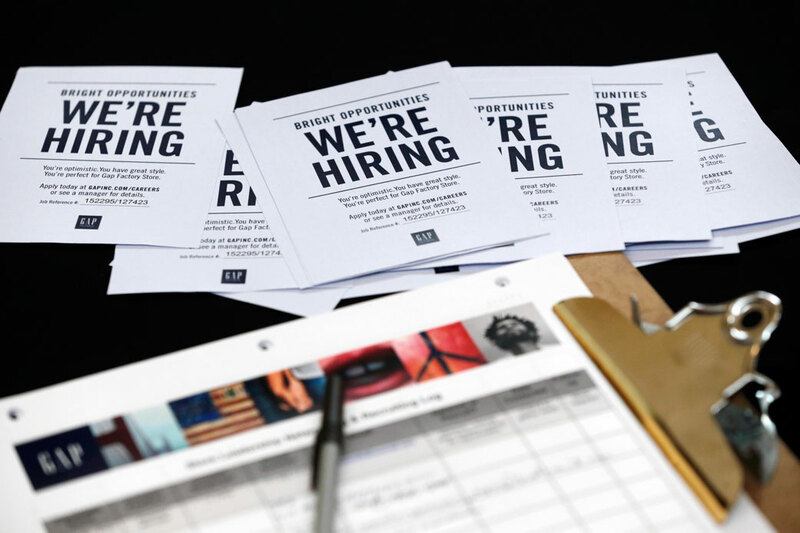 Job applications and information are seen on a table during a job fair in Miami, October 6, 2015. Reforms are needed to ensure that people with criminal records have equitable access to the labor market and economic security. Each year, more than 600,000 people1 are released from federal and state prisons in need of jobs that provide economic security. Research shows that having a job and somewhere to live can reduce the likelihood of recidivism.2 Yet returning citizens often face substantial barriers to re-entering the labor market. This is especially true of returning citizens of color, who already face multiple barriers to labor market entry. While this progress is encouraging, there is still much more work to be done to ensure that individuals with criminal records have full access to the labor market and basic services. Policymakers and advocates have supported several policy changes as well as best practices for employers that will allow people with criminal records to receive fair consideration for employment. These include policies that support record-clearing through seal or expungement; bans on employers inquiring about arrests that do not result in conviction; or employer best practices such as allowing applicants to provide evidence of rehabilitation or to review their background checks for accuracy. Over the past two decades, so-called ban the box policies have grown in popularity among localities, states, and the federal government. Broadly speaking, the purpose of ban the box is to help people with criminal records more easily access the labor market by removing a key barrier: the box on an employment application that requires applicants to disclose their criminal history. Checking this box can lead to an application’s immediate rejection before an employer even reviews an applicant’s qualifications. Ban the box does not prohibit employers from inquiring about criminal records entirely; rather, it delays the inquiry until later in the process, once employers have had an opportunity to assess applicants on their merits. This policy can help ensure that employers do not discriminate against people who have a criminal record during the hiring process. The federal government has also weighed in, establishing guidelines for employers across the country and implementing policies aimed at federal agencies and federal contractors. In 2015, then-President Obama signed a presidential memorandum directing the Office of Personnel Management (OPM) to ban the box for federal hiring of employees.44 The OPM issued a proposed rule governing the policy in April 201645 that was finalized in December 2016.46 The rule prohibits federal agencies from making criminal inquiries until an applicant has been extended a conditional offer. Agencies are permitted to pursue exceptions from the OPM if there is a legitimate reason related to the position that criminal history should be inquired about earlier in the process.47 While the rule only applies to federal agencies, it is an important first step toward ensuring that the federal government is a leader on fair chance hiring, setting an example for other employers across the country, including federal contractors. Because an arrest by itself does not prove criminal conduct, except in rare situations where the employer can prove that the underlying conduct occurred, the use of arrests will likely violate Title VII, according to the EEOC. Title VII, as described by the EEOC guidance, requires employers to conduct a case-by-case analysis of an individual’s record, taking into account the age of the conviction; the nature and gravity of the offense; and whether the offense is related to the specific position. Thus, blanket restrictions against hiring anyone with a misdemeanor or felony record will likely violate Title VII. In order to avoid liability under Title VII, the EEOC guidance also urges employers to conduct an “individualized assessment,” whereby the employer notifies the applicant that they may be excluded because of their criminal record and allows the applicant to present evidence to the employer that the exclusion should not apply. In addition to setting forth the Title VII standards described above, which are based largely on criminal background check cases decided before the courts, the EEOC guidance provides a set of best practices for employers to follow. For example, the guidance recommends that an employer wait until the end of the hiring process to ask about conviction history to help ensure that employers do not violate Title VII. In practice, fewer than half of the states, counties and cities with ban the box policies follow the EEOC individualized assessment criteria.54 Employers who do not comply run a greater risk of violating Title VII, and the EEOC has brought litigation in recent years against employers who have done so in this context. In 2013, following the issuance of the EEOC guidance, the Department of Labor Office of Federal Contract Compliance Programs, (OFCCP) issued Directive 306, “Complying with Nondiscrimination Provisions: Criminal Record Restrictions and Discrimination Based on Race and National Origin.”56 The directive clarified that the EEOC guidance applies to federal contractors, in order to ensure compliance with anti-discrimination and affirmative action obligations under Executive Order 12466. This order prohibits discrimination unlawful under the Civil Rights Act by federal contractors.57 The OFCCP also noted in the directive that it was aware that some federal contractors had blanket bans that bar anyone with a criminal record from employment consideration, and that those policies likely violate Title VII.58 The directive was a crucial step for the OFCCP because it clarified that contractors must comply with the EEOC guidance in order to meet their nondiscrimination obligations. It also made contractors aware of the best practices the EEOC laid out in the guidance as well. The Center for American Progress recently commissioned the Equal Rights Center (ERC) to conduct an analysis to assess whether and how federal contractors are complying with Directive 306. In addition to background research on the fair chance hiring policies of top federal contractors, the ERC used matched-pair resume testing to probe how applicants were treated in the application process. The project’s major finding was that the companies tested had inconsistent policies regarding criminal record inquires in the hiring process, indicating that many companies have not fully implemented the policies outlined in the EEOC guidance. The ERC identified the 100 largest federal contractors, as recognized by the Federal Procurement Data System (FPDS),59 then conducted online research to obtain criminal-record-related hiring policies for the top 50 companies, measured by total federal dollars obligated to each firm annually. From that group of 50, one was eliminated due to limited job availability, and another was eliminated because the ERC was unable to create a resume, as the job postings lacked job descriptions. Two others were eliminated because they were owned by or affiliated with a company that already appeared on the list. The ERC went to the next four companies on the FPDS list to replace these firms, one of which was subsequently eliminated due to challenges in submitting resumes before jobs were no longer available. This took the number of firms tested down to 49. The ERC then sent resumes to the selected companies to conduct matched-pair testing, a method by which two applicant profiles are created that are similar in every respect except one. The only distinction between the two applicants was that the test application indicated that the applicant had some criminal history, while the control application did not. The profiles were created to be suitable for entry-level jobs, so both indicated that the applicant was in their early to mid-twenties and had an associate’s degree. After the ERC submitted resumes, it monitored voicemail and email accounts created as part of the study for 45 days. Tests were terminated after the 45-day monitoring period. Of the 49 companies tested, six required applicants to disclose their criminal history on their job application—this finding is discussed in more detail below. As such, the ERC directly disclosed on the application whether the applicant had a criminal record. Among the remaining companies, the ERC indirectly disclosed an applicant’s criminal history by indicating on some resumes that the applicant had a year or more gap in employment and a GED diploma.60 Alternatively, the ERC’s applicant profile indicated that the applicant had spent some period of time employed by the state in a customer service position in a city where a minimum-security prison is located and had a subsequent three-month gap on their resume.61 The ERC tracked responses to each application for 30 days or until an in-person response was required by employers, whichever occurred sooner. Employers that received resumes were not notified either before or after the testing that the resume testing was taking place. Only six inquired directly about criminal history on the application. All the companies had nondiscrimination policies available on their website, but none addressed criminal records in their nondiscrimination policies. Nearly two-thirds had publicly available background check policies, but only 19 companies—more than half—addressed criminal records in those policies. In their nondiscrimination and background check policies, 10 contractors just indicated that the background check would include a check for a criminal record. Nine contractors noted that an employment offer would be conditioned on a criminal background check, indicating that the check would likely take place later in the hiring process, which is consistent with fair chance hiring practices. Six contractors, however, required applicants to disclose their criminal history during the application process, inconsistent with fair chance hiring policies. In each instance, the application only asked the applicant if they had a criminal record. None of the six companies specified what interactions with the criminal justice system required disclosure. For example, none made a distinction between arrests and convictions. In one instance, a contractor indicated that a background check would be run at the conditional offer stage, yet the company also stated that failure to disclose a felony conviction later uncovered by a criminal background check would be considered in the final employment decision. Similarly, another company advised applicants not to disclose a criminal record, yet the online application portal required applicants to select “yes” or “no” from a drop-down menu to indicate whether they had a criminal record. Applicants could not move on to the next phase of the application without answering the question. In the course of testing, none of the 49 companies studied allowed applicants the opportunity to supply either supplementary information or other documentation to explain their criminal history. Nor did any of the companies have a publicly available policy permitting applicants to review their background checks or supply evidence of rehabilitation. Our analysis did not turn up any company out of the 49 tested that publicly indicated that it imposed a blanket ban on people with criminal records, though across the board and as noted above, it was extremely difficult to obtain information about what companies’ policies were in relation to criminal records before applying to jobs. Moreover, it is unlikely that any company would publicly disclose that it had a blanket policy to ban individuals with criminal records. Another consistency across each of the companies tested was that the application process was difficult to navigate in regard to criminal records. Companies often did not fully explain their criminal record related policies upfront, requiring applicants to go through the entire application process to find out whether or how their criminal record might be treated. Employers were also unclear about what a criminal records check would entail, failing to list whether the inquiry would cover both convictions and arrests or misdemeanors in addition to felonies. Employers were similarly vague about or did not address when in the application process a criminal records inquiry would take place. This lack of clarity on how criminal records are handled puts an undue burden on applicants, who may go through the entire application process only to find out at the end that their arrest or conviction record disqualifies them from employment consideration. Our analysis also suggests that contractors may not recognize the policies outlined in the EEOC guidance and in Directive 306 as nondiscrimination policies, even though the stated purpose of the directive is, in part, to provide federal contractors and subcontractors information about “the circumstances in which exclusions of applicants based on their criminal records may violate existing nondiscrimination obligations.”62 While all contractors listed nondiscrimination policies on their website, none of those policies addressed criminal records. As noted above, the EEOC established the 2012 guidance to prevent civil rights violations in the employment process. Furthermore, the OFCCP has been clear that the purpose of its directive is to help contractors and subcontractors comply with nondiscrimination provisions, including the EEOC guidance. Whether criminal records should be addressed in companies’ nondiscrimination policies, in order to provide clarity to applicants, is a question for further debate. Perhaps most importantly, our analysis suggests that employers need to take greater care to implement fair chance policies effectively. To that end, employers should adopt the best practices that the EEOC has identified. States can play a role as well. For example, the Council of State Governments facilitates peer networks and information exchanges on re-entry.63 A similar network, either between employers or states themselves, could be devised to share best practices. As documented above, contractors are either uncertain how to implement the EEOC guidance fully or disregarding it, both of which can open them up to Title VII liability, as well as create a confusing or potentially discriminatory process for job applicants. Our research strongly indicates that there is still more work to be done to implement ban the box policies in the federal agencies, states, and localities that have adopted them, as well as among contractors for whom guidance has been issued. Moreover, it suggests that other critical fair chance hiring policies are not receiving the same level of consideration among employers. For ban the box to be most effective, however, employers must have a better understanding of how to implement the policy successfully. Moreover, states, localities, and the federal government should seek to adopt a multi-pronged approach to fair chance hiring, implementing policies that address the numerous barriers to employment that people with criminal records face. Finally, further research is needed to evaluate the effects of ban the box and other fair chance policies to ensure that they are implemented in a manner that creates greater employment opportunities for all individuals with a criminal record. States, localities, and the federal government should take these affirmative steps to ensure that people with criminal records have access to the labor market, and they should also continue to evaluate what other policy changes are needed to remove obstacles to labor market entry and success. Far too often, a criminal record is a permanent obstacle to economic security. This is especially true for communities of color, who have disproportionately felt the effects of mass incarceration and overcriminalization. But it doesn’t have to be that way. Thoughtful, well-executed reforms can ease access to the labor market for people with criminal records. These fair chance hiring policies, including ban the box, can ensure that employers evaluate candidates not on their criminal history but instead on their ability to do their jobs successfully. Angela Hanks is the associate director for Workforce Development Policy on the Economic Policy team at the Center for American Progress, where her work focuses on policies that raise workers’ skills, wages, and employment opportunities. Previously, she worked for the National Skills Coalition and for Congressman Elijah E. Cummings (D-MD). The author wishes to thank Ed Chung for his guidance, Maurice Emsellem for his thoughtful feedback, and the Equal Rights Center for their invaluable research on this project.